Jo napot kivanok baratom (I wish you a very good afternoon my friends). I knew I was in for the adventure of a lifetime, watching Aimee packing for our 8 week trip, around 5pm the evening before we were to leave. I lay on her bed watching in awe, as she managed to have everything ready by 11.30pm (totally mystifying to me, as I packed meticulously over a two week period). Aimee’s ability to pack was to be a feature of our trip, directly contrasting with my own. On the upside, this speedy packing allowed us a solid three hours sleep before we left her house at 3.45am the next morning for the long drive to the inappropriately named Glasgow Prestwick Airport (as it is some 100km from Glasgow). Elvis must have been a little miffed when he landed there. YAWN. Nothing wakes you up like discovering on check-in, that RyanAir’s bag weight limit is 15kg, not 20kg. Aimee and I were ‘those’ people, luggage spread out on the ground, frantically redistributing our gear and layering up into our heaviest clothes and for me, incurably stenchy riding boots. 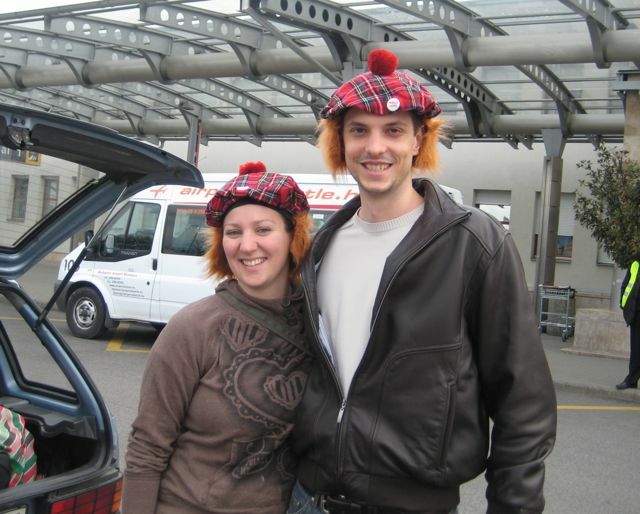 After swearing we wouldn’t buy a SINGLE thing on our entire trip, we promptly purchased four ‘Jimmy hats’ (red tartan hats with orange hair poking out the sides that make noises vaguely like bagpipes) and waddled on the plane after I dropped, lost, then found, my passport. Onward to Hungary! After my first truly budget airline experience (even at 5’4″ MY legs were cramped!) and looking like two penguins wearing Jimmy hats, hauling sleighs piled high with gear and dancing the highland fling, we exited customs and jumped on Marton and Vanda, our vanderful friends from Summer Camp. And what good friends- they, along with Vincy, Vanda’s boyfriend, were delighted to see the copious amounts of luggage we had with us- because it meant we could all be so close and cosy when squeezing 5 people into Vincy’s car- a 1985 Suzuki swift. Vanda managed a full sized suitcase under her feet in the front seat, while 6’3″ Marton tucked his legs behind his ears. Cruising just barely inches off the ground, we got our first look at a Central European country, before heading to our accommodation, a dorm at Vanda’s College. Taking every opportunity to use my hard learnt Hungarian I spluttered out a few words to the (frankly) very good looking man on the reception desk (in what I hoped came across as more friendly than ridiculous) causing everyone to laugh, but ensuring me a great smile every time we walked past, and excellent service. As a general rule, Hungarians are thrilled (and very surprised) with any attempt to speak their language. Monday….it rained. It’s lucky we weren’t put off by this, because…… it rained solidly until Thursday. 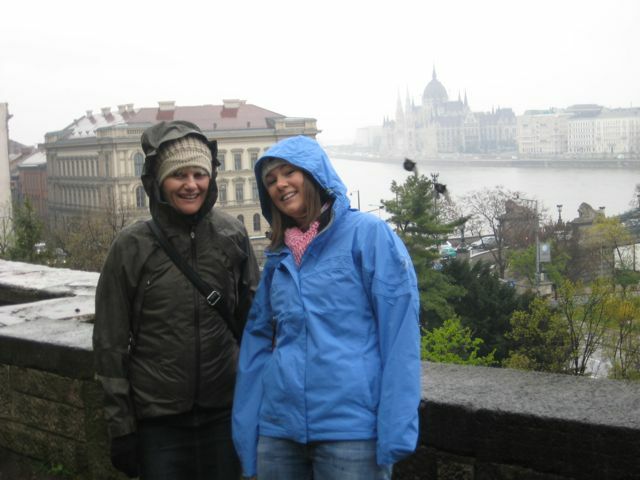 Aimee and I decided the best way to start our stay in Hungary would be with a trip to the Budapest History Museum. With some help from Vanda, we caught an appropriate bus, got off at exactly the right place…. and then spent nearly two hours walking in the cold and rain trying to find the museum. We did discover that the castle on the famous Castle Hill is VERY large, and that the National Gallery of Art spans about 300 acres (or so it seemed). And so eventually, to our relief, we did eventually find the Budapest History Museum…only to find that it was ZART (closed). On later reflection we did discover that the flyer we had on the Museum did mention it was closed Mondays…. up there for thinking. Shortly after this disappointment, we discovered the National Dance Theatre (I knew learning the Hungarian phrase “Will you dance with me?” would come in handy! ), and in from the rain we rushed. Well. We got a little more than we bargained for. After deciding it would be awesome to catch some Hungarian traditional dance we attempted to make some enquires about tickets. We approached a helpful looking lady in the lobby, who directed us to the lady behind the glass window who looked confused, and sent us back to lobby lady. Lobby lady made gestures that clearly meant, “Follow me”, and we found ourselves being led through a large hall and a series of passages and doors, one of which had to be unlocked. Wondering what on earth we were getting into, Aimee and I exchanged glances that said “What the..?” and “If you get out of this alive let my newly adopted parents know I loved them”. After several more twists and turns, the lady pointed us at an office door… and started to walk away! I spluttered something, and she turned back to see the bewildered looks on our faces. Very kindly, she knocked on the door, opened it, gestured us in…. and left. Awwwwkwarrrd. So, after saying ‘Sajnos kicsi tudok magyarul’ ( “I’m sorry, I only speak little Hungarian” which endeared me to practically everyone ELSE in the country), and discovering that the women in the office only spoke a little Angol, we then said a lot of things that the other didn’t understand. Eventually, looking for a way to escape gracefully, I just went with ‘semmi problemma’ (‘no worries’- not entirely appropriate, but very Australian and heck you run with what you’ve got!) backed out into the hallway, and found our way back to the locked door. We stood for a moment in the dimly lit hallway, vandering what to do next, when a large security man appeared, said nothing, unlocked the door, and just as quietly left, while we made our dash for freedom. 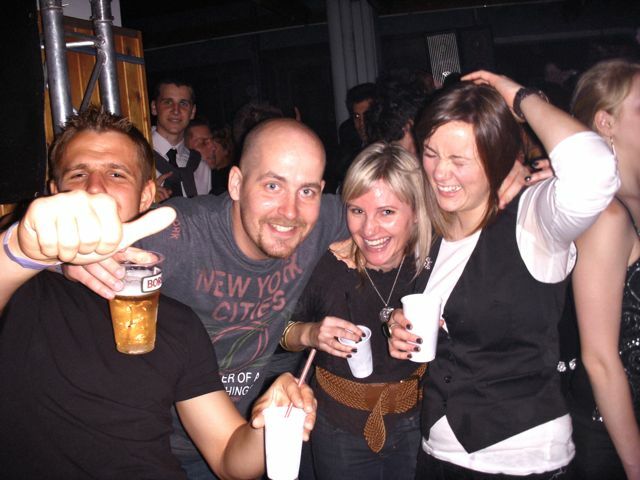 Aaah, if only, as Vanda pointed out to me, I had learnt some verbs, as well as a bunch of random words and pick up lines, we may have got to see some famous Hungarian dancing…. On the subject of language, while I didn’t get to use my much practiced phrase ‘hol van a nadram?’ (where are my pants?) the Hungarian I had learnt certainly came in handy many times. For instance, I decided it would be useful, in addition to telling Hungarians that I was a dolphin trainer, to say that my friend Aimee was a goat trainer. Vincy, Sparkles and Goat Girl at genuine Hungarian College party! However, the problem was I attempted to use these phrases at a College party at Vanda’s school, which was quite noisy. Oddly, the Hungarians did not seem familiar with their own language, which resulted in me doing a charade to mimic being a dolphin (probably not very well). More disappointingly, when I said Aimee was a goat trainer, my new Hungarian friends looked confused, leant over to Vanda, and repeated the word ‘kecke’ (goat) with quizzical expressions, assuming I’d got it confused with another word. On confirmation from Vanda, that I had it right they looked a little bewildered and quite honestly, were probably concerned that Aimee was a bit smelly. Stay tuned to find out how Aimee and I managed driving the crazy Hungarian highways in a ride on mower, and why I found Hungary’s second largest city a pain in the behind. I’ve also noticed that some boring and/or poorly written blogs get a lot of views. I’m Going to go with that they beg and plead their friends to comment. That’s my story and I’m sticking to it. Loved this blog post. If I ever go to Hungary I’ll definitely make sure to try and learn a few phrases. It just seems polite to at least ATTEMPT to speak the native language.